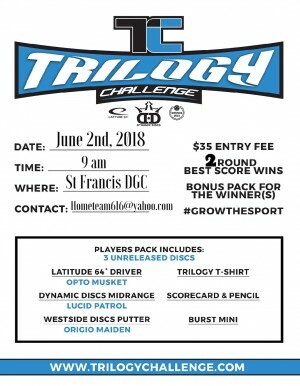 This will be the 5th straight year of HomeTeam hosting the Trilogy challenge at St. Francis. This event is a singles event for MPO FPO MA1 and FA1. It will be 2 rounds of 18 holes. First round will be the original course layout and the second will be all pf the short pin locations for lots of ace runs! Lunch will be available on site as always. This year it’s Burgers and Hot Dogs with sides, chips, desserts, and drinks. There will also be adult beverages for those of age available for a donation at the course and during play. There will be CTP and Long Putt prizes on every hole! This event is one of the most fun events of the year, the player packs are great and so are the staff and players. 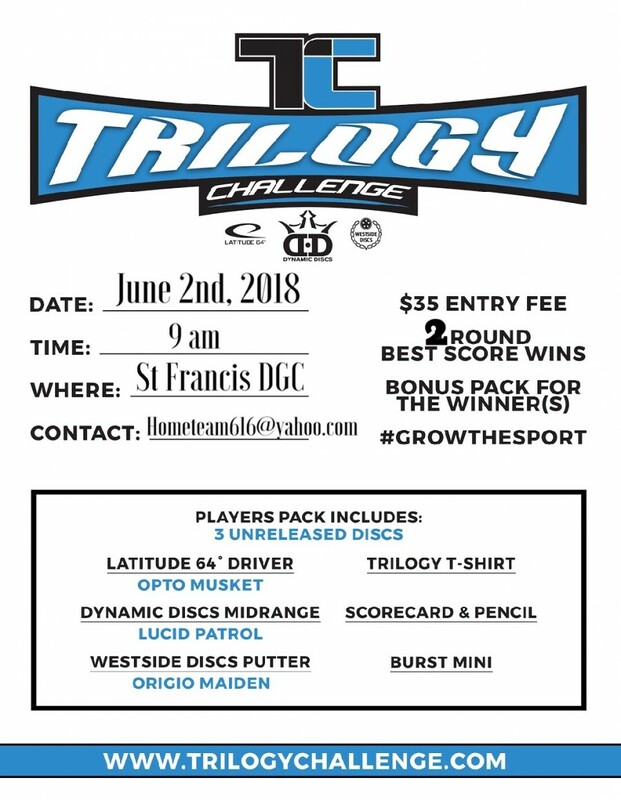 So come out and have a great day of fun with your friends at HomeTeam DG at St. Francis Disc Heaven. *We still have room for sponsors also, contact Chad Shine for more info. All funds raised through this years events and leagues at St. Francis are all going toward updating the old DGA baskets to a new set of high quality baskets, so just by playing you are helping make this course great again! !